First and foremost, you should be a "people person" who believes in making the customer your top priority. We're looking for hands-on operators with prior small business experience who will oversee the restaurant's day-to-day operation. Candidates should possess sales and effective management abilities, combined with maturity and high standards. We seek people who are actively involved in their communities and have a well-established network of personal contacts. Finally, you must be able to meet the initial investment requirements. When you become part of the Manny's franchise family, you will have access to our carefully planned system of support. Your training will begin before your doors open, with both on-the-job experience and also in the areas of administration, operations and sales/marketing. Training in food preparation will be uncomplicated - all of Manny's delicious recipes, from American to Greek to Mediterranean, require basic ingredients. Additional support includes site selection guidance, marketing and operational support, and, a comprehensive operations manual. Your initial costs to start a Manny's restaurant franchise will range between $258,667 and $512,667. These figures include a $35,000 franchise fee. Certain variables will affect the amount of your investment, including the size of your building, rent, property improvements, and others. You will also be charged a royalty fee of 5% of gross sales. Manny's cafes are a perfect fit for urban locations, city centers, suburban strip centers And mall food courts. Manny's Mediterranean Cafe puts you in the forefront of today's hottest franchise trends, the "fast casual" restaurant segment! Manny's feels we have a great niche in the Mediterranean market. This is virtually an untapped segment in the restaurant franchise industry. As we expand through franchising, we will be seeking qualified individuals to be considered for franchisee candidates. First and foremost, you should be a "people person" who believes in making the customer your top priority. We're looking for hands-on operators with prior small business experience who will oversee the restaurant's day-to-day operation. Candidates should possess b sales and effective management abilities, combined with maturity and high standards. We seek people who are actively involved in their communities and have a well-established network of personal contacts. Finally, you must be able to meet the initial investment requirements. When you become part of the Manny's franchise family, you will have access to our carefully planned system of support. Your training will begin before your doors open, with both on-the-job experience and also in the areas of administration, operations and sales/marketing. Training in food preparation will be uncomplicated - all of Manny's delicious recipes, from American to Greek to Mediterranean, require basic ingredients. Additional support includes site selection guidance, marketing and operational support, and, a comprehensive operations manual. 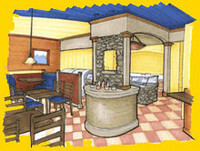 Your initial costs to start a Manny's restaurant franchise will range between $200,000 and $350,000. These figures include a $35,000 franchise fee. Certain variables will affect the amount of your investment, including the size of your building, rent, property improvements, and others. You will also be charged a royalty fee of 5% of gross sales.